From now on, we will let you know more about the places of VMC events thanks to this weekly column we write for our partner Venice Marathon Club. Running to feel good, to keep fit; run to win or to participate. Running for fun but also to travel and discover new places and places full of charm, as the historical center of Venice, of course, but not only. And what about you? Do you have already decided what will be your race? If not, here are some good ideas. 2017 has begun and spring is around the corner, there is no better time to mark on the calendar the date of our events. From the historic center of Venice to the Dolomites, this year will be full of challenges and there really is something to please everyone! As runner we know how important is to get ready for an event, both 10K or a marathon and we have developed a nice “focused training” program (no, we will not speak about training or what to eat before / during / after the race): “Stories by run” will take you into the places you go through running. Each week will take up points related to the first of the VMC scheduled events, with many curiosities about the territories and useful information to better manage the race and at the same time allowing you to enjoy the beautiful scenery around you. To open the dance (sorry, races) we begin with the Venice Night Trail – Saturday 29th April – a magical night 16k run in the heart of Venice, between the mystery and the discover of the wonders in the historic center. The course takes you through different zones: the districts, the 6 neighborhoods in which Venice has been divided from its origin. Running through calli and campielli, up and down 51 bridges, you’ll notice the four-digit numbers that identify the houses, because each district has a unique street numbers (sometimes you can see two very different house numbers in a short distance between each other!). The race starts and finishes in Dorsoduro, which extends into the southern part of the city, known as the university area is also characterized by the presence of important museums and galleries. The Zattere, a long and scenic promenade, will be the last stretch that from Punta della Dogana will take you to the finish line. The course also goes through the districts of Santa Croce, that together with San Polo stands in the central area of the city, Cannaregio, still characterized by an authentic and genuine atmosphere of the city, and Castello, the largest and well known among all as “the tail of the fish” because of its shape, until you get to St. Mark’s real heart of the city with its most majestic and imposing buildings. 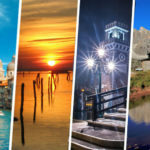 Venice Night Trail will be an opportunity to race in a unique atmosphere in the world, along “rii” and “canali” that insinuate themselves into the land of this island. Have a look to the gondolas (typical Venetian boats) look carefully one detail: the metal bow (a comb-shaped element). The decorations that decorate it have deep meaning: the six teeth facing forward represent the six districts of Venice, while the only tooth facing inward is the Giudecca, the longest island visible from Zattere belonging to the Dorsoduro district. The “hat of the Doge”, the bow above the highest tooth of the comb is the Rialto Bridge, finally, the “S” that starts from the highest point to get to the lowest point of iron is the Grand Canal. 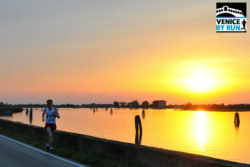 Stories by run is a weekly column provided by Venice by Run for the VMC – Venice Marathon Club events magazine.